Our native witch-hazel, Hamamelis virginiana, is native from Nova Scotia and Quebec west through southern Ontario, lower Michigan and southern Wisconsin and south to Florida and Texas. It is found most commonly on streamside banks and in the understory in moist woodlands. Witch-hazel is a multi-trunked, scraggly tree that grows to 35 feet tall with an arching habit that, to me, is most striking in the mid to late fall. Then, you will either see its soft glow of bright yellow flowers, or its golden foliage (or both at the same time) and if you are lucky you will find one with spicy-scented flowers. Its flowers are four-merous and measure up to an inch across. They form fruits which do not ripen until the following fall. The fruit are easily collected and they grow well from seed. Seeds can often take a year or more to break dormancy, so be patient if you want to propagate some this way. Be sure to store the capsules in a paper bag, as they pop open forcefully. Seeds can be expelled up to twelve feet from their parent! The leaves of witch-hazel emerge in spring with a reddish tinge, before turning green. They are 6" or less in length, more than half as broad with scalloped margins. There is a lot of variation in individual plants, so some are better for your garden than others. Horticulturists tend to appreciate the ones that lose their leaves while the flowers are still in full bloom. 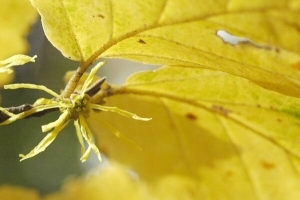 If you want to have a specimen witch-hazel in your landscape and are a good propagator you could find your favorite plant, flag it, and then return in spring and take some cuttings. My favorite specimens are along Station Road in West Danby, where they lean out over the road, growing on the edges of rock ledges, and along the Abbot Loop in the Danby State Forest. 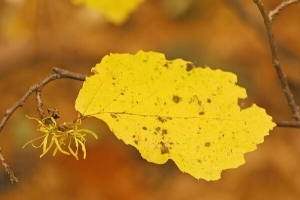 Witch-hazel has been used by humans for some time. The bark is distilled to produce the witch-hazel astringent that can be purchased in drug stores. It is used for insect stings, and abrasions. Home made ointments can be used to help with varicose veins and damaged blood vessels under the skin. Witch-hazel branches are also used as a tool for dowsing for water. Cardinals and ruffed grouse eat the seeds, and its leaves are a favorite of early instar gypsy moth larvae. Asian witch-hazels, H. mollis, H. intermedia ( H. japonica x mollis) bloom in the late winter. They have been selected and bred to come in a wide array of colors, from deep reds to burnt oranges to bright yellows and for scented flowers. Hamamelis vernalis, native to the Ozarks, blooms in the early spring, and is known for its bright yellow, strongly scented flowers and compact habit.